The Trafalgar Traditional Dual Exposed Thermostatic Shower Valve offers thermostatic showering with two easy to operate controls, one operates flow control whilst the other allows temperature selection. 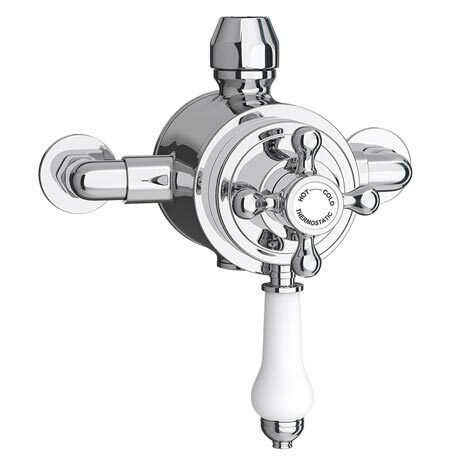 To be used with a slider rail or rigid riser kit, this valve has the added safety benefit of a built in anti-scald device should the cold water supply fail. The traditional style of this exposed shower valve adds a touch of sophistication and elegance in any bathroom. Suitable for modern pressurised plumbing systems. Please note: Shower valve will not work efficiently on a gravity fed tank system, unless a booster pump is installed. Saved for the future and I will use them again. Looks good. Modern in an old fashioned way. I like. My wife liked it and installation was easy straightforward. "Seems like a good product so far. Solid, with the traditional look we wanted. It is more powerful than our previous similar shower." The service and good are tops orders deliverd fitted in use. Very happy quality product very happy. "Bought this mixer to replace an old, faulty one. My plumber fitted it without too much trouble and it works a treat. It complements my existing shower riser perfectly. Very pleased and a good price. Would consider buying another one for our other shower." "Very well made, high quality." This was a replacement as we purchased cheaper item somewhere else but was charged top dollar for it it broke and was unable to fix it so I came across identical one at Victoria plumbing and was very very very happy with item far superior quality weight and overall appearance.